Key Difference: Celsius, also known as centigrade, is a commonly used unit system that is used to measure the temperature. The Kelvin scale was proposed by William Thomson, 1st Baron Kelvin in 1848. He proposed developing an absolute, thermodynamic temperature scale, using its base point as absolute zero. Temperature calculation has become an important part of everyday lives. Before we leave our homes, we check the temperature on a weather channel in order to see if we need to carry a jacket. Kelvin and Celsius are two units of temperature measurement that are used in fields such as physics, thermodynamics, engineering and astronomy. Both are a part of the International System of Units. 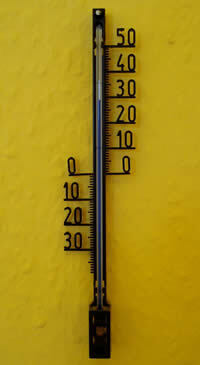 Celsius, also known as centigrade, is a commonly used unit system that is used to measure the temperature. The Celsius scale was developed by a Swedish astronomer named Anders Celsius at the University of Uppsala, Sweden in 1741. This scale was bit different from the scale we know now, though it consisted 0 to 100 degrees, Anders marked the boiling point of water as 0°C, while freezing point of water was 100°C. Upon Celsius' death the points of the scale were reversed to the modern one we now know. From 1743 until 1954, the Celsius scale was defined by the freezing point (0 °C) and the boiling point (100 °C) at a pressure of one standard atmosphere. 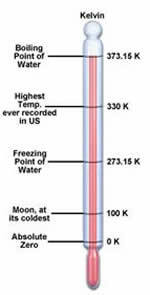 In 1954, under international agreement, the Celsius scale is now defined by two different temperatures; absolute zero (-273.15 °C) and the triple point of water (0.01 °C). These terms connect the Celsius scale to the Kelvin scale. The Kelvin scale was proposed by William Thomson, 1st Baron Kelvin in 1848. He proposed developing an absolute, thermodynamic temperature scale, using its base point as absolute zero. This scale has no negative units. Absolute zero is the null point, below which temperature does not exist and molecular energy is at a minimum. Kelvin is not marked by a degree symbol, but just a K. Absolute zero on a Kelvin scale translates into -273.15° on a Celsius scale. The triple point of water on a Kelvin scale is 273.16 K.
The kelvin can also be used in order to measure color and noise, in addition to temperature. Color temperature is based upon the principle that a black body radiator emits light whose color depends on the temperature of the radiator. For noise, kelvin is used as an indicator of how noisy a circuit actually is in relation to an ultimate floor noise. Kelvin scale is most commonly used in the scientific community, while Celsius and Fahrenheit is used for daily use. Converting from Kelvin to Celsius and vice versa is simple really; if you are converting from Celsius to Kelvin add 273.15 (K= °C + 273.15) and if you are converting to Kelvin from Celsius subtract 273.15 (°C= K-273.15). I found this info helpful and interesting since I didnt notice that kelvin scale actually can measure color and noise..